How often have you heard the claim that chimpanzees who have moved to a sanctuary have felt “dirt and grass under their feet, sunshine on their faces” for the first time in their entire lives because they have come from laboratories where they have only known barren, concrete environments? Chimpanzees at the Yerkes National Primate Research Center. You may hear it pretty often if you follow the fundraising and publicity campaigns that are aimed at raising money to support facilities that care for animals retired from research. Among many examples, are recent comments by Cathy Willis Spraetz, president and CEO of Chimp Haven. Chimp Haven is the US chimpanzee sanctuary supported and administered primarily by the National Institutes of Health (NIH) through public, federal funds that assure lifetime retirement care of research chimpanzees. Chimp Haven was founded in 1995 by behavioral scientist Dr. Linda Brent and a group of primatologists and business professionals. The image and language resonate. They evoke emotional responses in compassionate people who care about animal welfare. But are they claims that are representative of the actual situation? In many cases, they are not at all. 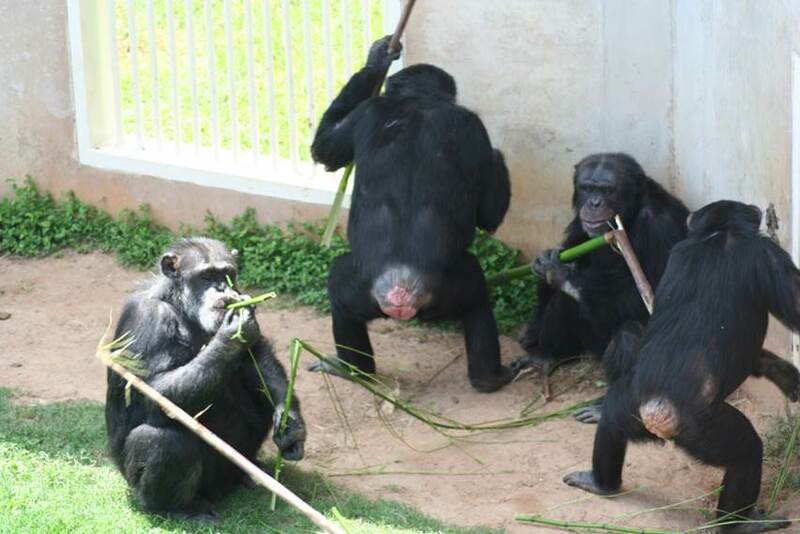 For example, the picture below shows chimpanzees in four settings. In each, it is easy to see that the chimpanzees have dirt under their feet and sunshine on their faces. Where are they? Two are current research facilities, one is an NIH-funded sanctuary, and one is a publicly-funded zoo. Clockwise: Top – Yerkes National Primate Research Center, Atlanta, GA (Note: Yerkes’ chimpanzees are not NIH-owned or supported); Lincoln Park Zoo, Chicago, IL; MD Anderson Keeling Center for Comparative Medicine, Bastrop, TX; Chimp Haven, Keithsville, LA. In fact, the majority of research chimpanzees in the US live in settings that provide outdoor housing, including dirt and sunlight. They also provide extensive and complex climbing structures, opportunities for foraging and tool-use, toys, fresh produce and treats, bedding, interaction with expert and compassionate caregivers, and state-of-the-art medical care and facilities. Are all the facilities equal in all aspects? No. But neither are the sanctuaries, zoos, and other settings that house chimpanzees in the US– more chimpanzees, in fact, than are housed in research facilities (Chimp Care). * Furthermore, those research facilities are subject to more extensive standards, greater public oversight, and more public transparency than the zoos, sanctuaries, entertainment, and private homes that house chimpanzees. 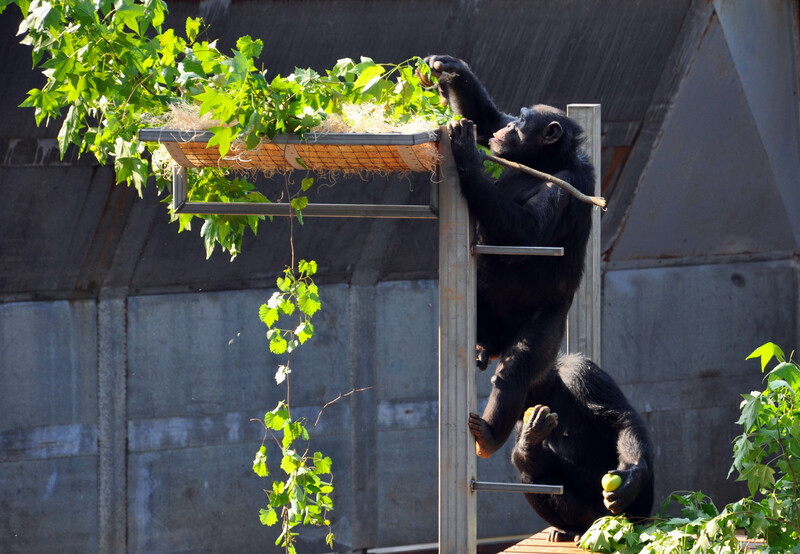 Misrepresenting chimpanzees’ current housing and care is a problem. There are a few explanations for why anyone would make the claim, or use partial truths, to encourage others to believe that most research chimpanzees live in barren concrete environments. One is simple lack of knowledge and experience. Another is a deliberate misrepresentation. Neither serves the animals or partnership with others in order to thoughtfully provide for the chimpanzees’ best long-term care. Nor does it serve the public. It is likely that many members of the public may not be familiar with accurate representation of the conditions and housing of chimpanzees in NIH-funded primate centers. That is not the case, however, for many involved in sanctuary efforts and who have first-hand knowledge of the dirt, sunshine, and enriched care that chimpanzees receive in many– if not all– research facilities. 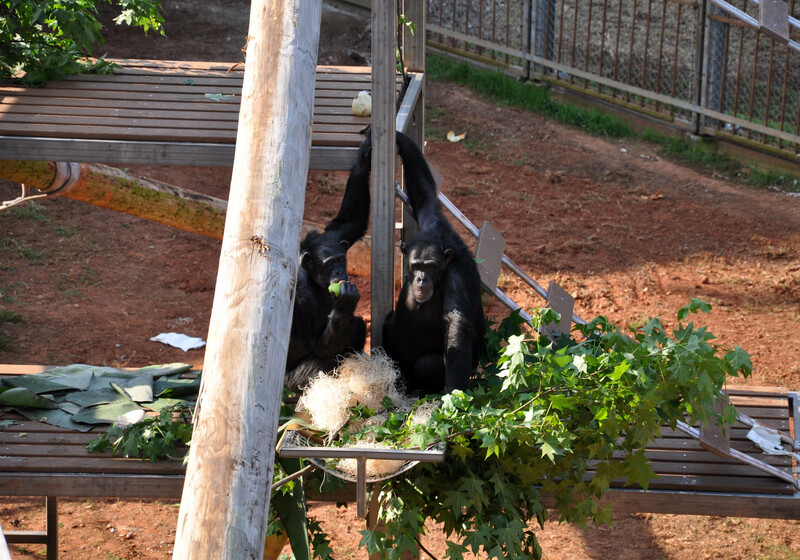 The question isn’t whether there is room for continuing improvement in captive chimpanzee care and housing. No one would claim any captive setting is the same as the wild, or that any sanctuary, zoo, or research facility is beyond improvement. (The same is true for the wild, where chimpanzees are subject to many negative outcomes due to human influence and vital conservation efforts require more support.) But in reality, there is often more similarity than difference in chimpanzees’ actual care and housing between many of the best sanctuaries, zoos and research facilities in the US and in other countries. The question is how to identify best practices that balance animal welfare and the facilities’ purposes and then find workable solutions and funds to make them common practices. 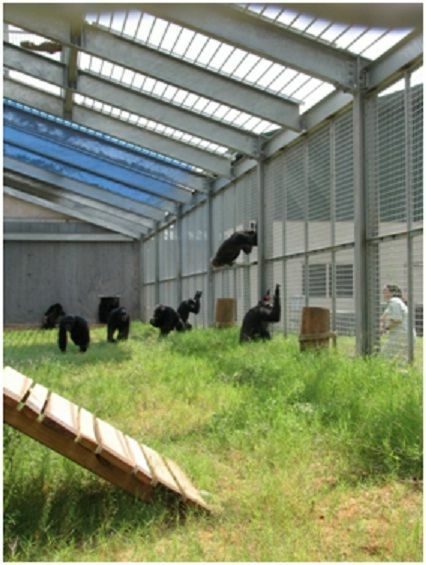 Furthermore, a closer comparison of the actual conditions at the federal sanctuary facility and those at the facilities in which the animals currently live is also key to serious, fact-informed evaluation of statements made about the NIH’s progress and eventual decisions about moving chimpanzees from their current homes to Chimp Haven. In this weekend’s CNN story, the director of Chimp Haven makes a number of arguments in favor of increased funding and speeding the movement of chimpanzees to the Louisiana facility. Many of those arguments revolve around whether, and how much of a difference there is between the different settings, and whether there is a difference to the animals’ well-being. The quality of all of those evaluations depends on factual and specific comparison, as well as evidence for meaningful difference in the animals’ well-being. The balance of benefit and harm includes the known stress to the animals that is caused by moving across country, into new situations, and into new social groups. Although movement to sanctuary may have benefits, it also has costs to the animals. For example, beyond relocation to unfamiliar housing, care practices and caregivers, the animals also face potential disruption of their social groups, introduction to new groups and upheaval in dominance hierarchies. The adverse impact of these stressors is of particular concern for elderly animals and for others who may be especially vulnerable to negative health effects of stress. Thus, consideration of those balances and comparison of different facilities must be taken together to inform decisions about investments that best suit the animals’ needs. Chimpanzees at MD Anderson Keeling Center for Comparative Medicine, Bastrop, TX. An analysis by the Congressional Budget Office (CBO) in 2012 estimated an additional $56M cost to retire and maintain federally funded chimpanzees for a 5 year period (not the animals’ lifespan). The cost to support the entirety of the NIH’s ~500 chimpanzees may be roughly $8M each year; although the cost will likely vary significantly with increasing medical and care needs as the population ages. The CBO analysis also determined that there was no cost savings to moving federally-owned chimpanzees to sanctuary instead of research facilities. US federal funds provide the majority of revenue for Chimp Haven and support the majority (~75%) of the cost of each NIH chimpanzee retired at Chimp Haven. 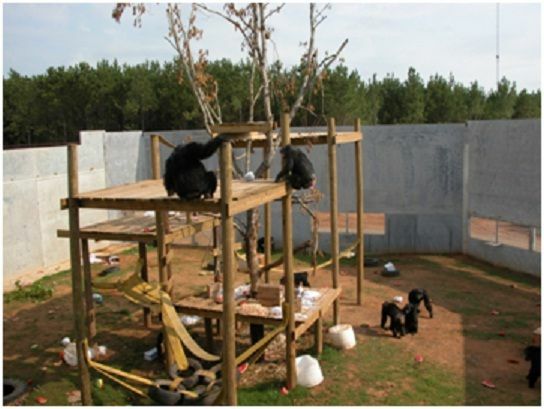 Chimp Haven was built and funded primarily for retirement of publicly-owned research chimpanzees. However, it is also used for retirement of privately owned animals who are not supported directly via federal funds. In October of 2014, NIH reported an annual expenditure of $4.44M to Chimp Haven for the care of 191 NIH-owned chimpanzees and an average care cost of $63 per day per chimpanzee. The same report includes a range of $32-60 daily care cost for chimpanzees in other NIH facilities that house NIH-owned chimpanzees. Federal support for chimpanzees goes beyond direct care of research animals. For example, NIH and NSF supported scientific research has produced new knowledge that continues to benefit chimpanzees in the wild and in captivity. Furthermore, federal investment in the nation’s primate research centers from the 1960s on supported continuing advances in chimpanzee housing, care, and enrichment that now drive best practices and chimpanzee health care in zoos, sanctuaries, and research facilities. Is misrepresenting research facilities necessary? It is unfortunate that some of those leading sanctuary publicity and fundraising efforts continue to base their appeals in claims that generally have little basis in current fact. It is also unfortunate that the many campaigns for fundraising for the federal sanctuary fail to let the public know that the NIH and US have, in fact, pledged lifetime support for federally-owned chimpanzees. This level of public support has not always occurred in those countries that have dismantled their chimpanzee research facilities. Some of the current campaigns centered on US chimpanzees give the impression that NIH ended research and put the chimpanzees out on the street without a dime, leaving others to provide for their “rescue.” That is far from the truth. Fundraising is required to meet roughly one-quarter of the cost for NIH-owned chimpanzees at Chimp Haven and the full cost for chimpanzees at other sanctuaries. But for those that care about supporting the animals and decisions in the animals’ best interests, that fundraising should not require a storyline based in half-truth or deliberate misrepresentation of the conditions in other facilities or the efforts of others who care for chimpanzees. * An estimated 1,822 chimpanzees live in the US. The care for roughly half of the chimpanzees in the US, including most of the 206 chimpanzees retired to the federal sanctuary (Chimp Haven), is provided in large measure by federal public funds. According to Chimp Care, a census project from Lincoln Park Zoo, US research facilities house 625 chimpanzees, while a research reserve houses 172. Private sanctuaries house roughly one fifth of US chimpanzees (N=318). Nearly one-quarter of the chimpanzees in the US live in zoos, both those accredited by a non-public agency, the American Zoological Association, (262) and facilities designated as unaccredited in Chimp Care’s data (174). Chimpanzees in the US are also kept in entertainment venues (14) or by private breeders and private owners who regard them as pets (51). Such private ownership of primates is opposed by leading scientific organizations including the American Society of Primatologists. Posted on February 9, 2015 February 9, 2015 by EditorPosted in NewsTagged animal research, animal welfare, Chimp Haven, Chimpanzee, national primate research center, NIH, retirement, sanctuary, zoo. My recollection about Beulah was that it was just a film clip of a chimp with some sort of round wooden flute in its mouth, to accompany a buzzer sound effect. Later on they just played the buzzer and attributed it to Beulah. I think this is a justified movement! When everything is over chimpanzees will feel great there. Greetings, Man With Van Richmond Ltd.
Theodora Capaldo, Jen Feuerstein, and Rachel Weiss have done a great job explaining the truths behind chimpanzee retirement from research, and each are highly qualified to do so. The North American Primate Sanctuary Alliance (NAPSA) would like to clarify something further: NAPSA membership requires sanctuaries to be licensed by the USDA. Legitimate sanctuaries are transparent organizations that encourage the oversight and public assurance offered by a USDA license, whose inspection reports are available to the public. Because there is no other option through the USDA, an exhibitor’s license is the closest fit. There is no USDA license specifically for sanctuaries. That being said, NAPSA sanctuaries are prohibited from offering unescorted public visits or engaging in any commercial trade involving resident animals. Our sanctuaries, their enclosures and their policies, are designed to further the best interests of the primates we serve. For further information, please view our NAPSA’s membership requirements on our website at: http://www.primatesanctuaries.org/membership/membership-requirements/, or you may email me at admin101@sanctuary-alliance.org. Many years ago I proposed a solution to the chimpanzee “problem.” The chimpanzees would be retired to beyond state-of-the-art facilities where they could live out their lives peacefully in comfortable quarters that provided safety and security, and complex outdoor environments. These would have been super research zoological gardens that emphasized wellness and healthy aging for resident nonhuman primates. I have always felt that we have things to learn from each individual, and a program of individualized monitoring of health and behavior would have been an important aspect of this setting. As genomics began to develop, we advocated for the complete sequencing of the chimpanzee genome as a high priority. Of course, real advances in individualized medicine could have come from noninvasive individual genomic profiles. See, for example, my chapter, “One Gerontology: Learning about Aging from the Great Apes,” in my book (edited with Patrick Hof, MD) AGING IN PRIMATES. Karger, 2002. Facilities of this kind could have been supportable by the NIA, Ellison Foundation, etc., and would not have needed to resort to horror stories of real or alleged abuses to raise donations from the public. The public, I am confident, would have been supportive of the attention to individual health and well-being, as well as the important information on aging that would have been generated. I even had in mind that homes would be located around the perimeter for caring people who would participate as docents, observers, and/or patrons. The spacious grounds would have been available to them. The facility (or facilities) would have been located near veterinary and/or medical schools that could have used the facilities as “one health” training facilities. Sadly, even though colleagues and I made substantial progress toward such a facility, in the end we failed to obtain the necessary financial support. Is it too late to convert any of the best facilities to this use? Can’t we find innovative and constructive ways of generating support, rather than using these chimpanzees as poster children for the endless and hateful campaign against science and scientists? Dr. Rowell, while you are technically correct in your recitation of the law, you seem to be unaware that Save the Chimps and each of the NAPSA sanctuaries have chosen to be licensed as exhibitors with APHIS. My understanding is that they have done so in order to be able to allow periodic controlled visits from the public and to establish their credentials as skilled care facilities. You seem to be having difficulty accepting the fact that chimpanzee sanctuaries in North America have exceptionally high standards of care that may actually exceed the standards in the labs. Individuals or businesses with warm blooded animals that are on display, perform for the public, or are used in educational presentations must be licensed as exhibitors with APHIS. Licensed exhibitors include circuses, zoos, petting farms/zoos, animal acts, wildlife parks, marine mammal parks, and “some” sanctuaries. Animal preserves, or “sanctuaries” that maintain exotic or wild animals, are exempt from regulation provided they do not exhibit or use the animals for promotional purposes, including fundraising, or sell animals. As someone who has written “that chimpanzees who have moved to a sanctuary have felt dirt and grass under their feet, sunshine on their faces for the first time in their entire lives because they have come from laboratories where they have only known barren, concrete environments,” I was mystified (and to be quite honest, somewhat insulted) by the suggestion that what I have written is a fabrication, misrepresentation, or “myth.” The author is clearly unfamiliar with the histories of chimpanzees retired to sanctuaries to date. To illustrate, of the 287 chimpanzees retired to Save the Chimps from The Coulston Foundation (this includes the 21 Air Force chimps who were the first STC residents), 73% were captive born and had never set foot on anything but concrete or steel. 2% were captive born but had, at some point in their lives, lived in an environment where they had some contact with natural substrates (but not in the lab.) 25% were wild born (and captured at a very young age after their mothers were killed) but had not lived on any surface other than steel and concrete for 27-40+ years. Just because there are chimps still in labs who have living conditions with natural substrates does not mean that chimps already retired to labs had the same experience, and is not a reason to malign sanctuaries and suggest that they are exaggerating or misrepresenting the chimps’ histories for fundraising purposes. Additionally, to address Dr. Rowell’s comment above, professional sanctuaries are licensed and inspected by the USDA, and in many cases by state agencies. The statement above that “only one federally supported sanctuary must comply with the requirements set forth in the Animal Welfare Regulations (9 CFR parts 1 through 3)” is a tautology. There is only one federally supported sanctuary. However, non-federally supported sanctuaries are also subject to the Animal Welfare Act and its associated regulations. 1)	The USDA does not accredit laboratories, zoos, or sanctuaries. 2)	Only one federally supported sanctuary is monitored on a regularly scheduled basis by representatives of NIH. They are required to obtain and maintain an Animal Welfare Assurance from NIH’s Office of Laboratory Animal Welfare (OLAW) when and only if chimpanzees are used for noninvasive studies as authorized in the CHIMP Act. 3)	Only one federally supported sanctuary must comply with the requirements set forth in the Animal Welfare Regulations (9 CFR parts 1 through 3). I wish I could say this updated information makes me feel better. But the corrected specific does nothing to weaken arguments that retired chimps do not belong in a lab. It strengthens the case that while a rose is a rose, a lab is not a sanctuary. What Yerkes may think of as improvement to their lives is pathetic — an additional small outside barren enclosure can at best be called a new version of impoverishment. And the Yerkes decision to send chimps to an unaccredited zoo in a foreign country to rid itself of financial responsibility for their care, is nothing short of abandonment. Sanctuaries have to raise money to support their direct chimp care. It is hard work yet they promise that care for the life of the chimpanzee. Labs have made millions of dollars warehousing chimpanzees for decades including generous indirect dollars to use as the labs will. Now, when the money is about to dry up, they look for ways to rid themselves of financial responsibility for those lives they once used and from whom they profited plenty. Furthermore, Allyson, I’ve been trying to understand the purpose of your article. Are you a mouthpiece of the laboratories, trumpeting their bizarro position that now they should be considered chimpanzee retirement homes? Are you trying to convince the public that biomedical research labs really aren’t so bad, because you know the chimps won’t ever be sent to sanctuary? Why are you attacking Chimp Haven for its fundraising message when you could be promoting the retirement of the remaining federally-owned chimps to that facility? It’s no secret that most laboratory chimps have been housed in deprived conditions, so why are you balking at the description now? You cannot rewrite history! Although the NIH’s position on the eventual phasing-out of invasive research on chimpanzee subjects was not the paradigm shift that many of us advocates had hoped for, the fact remains that the scientific establishment has conceded that research on chimps must come to an end (or, as stated by IOM, “most current use of chimpanzees for biomedical research is unnecessary.”) It really is time to close this chapter, and fund the release of all NIH chimps to suitable sanctuaries (including capital needs plus lifetime care). The time for these games is over. The North American Primate Sanctuary Alliance (NAPSA) sanctuaries all provide exceptional housing, nutrition, enrichment, and psychological and medical care — as NIH officials well know. So why slam the sanctuaries? What is the NIH’s agenda? Do researchers intend to continue invasive studies despite the IOM report and NIH statements to the contrary? What other reason could they have for wanting to keep the chimps where they are? The federal government has had the chimps long enough. They made this mess — they stole chimpanzees from their homes in Africa and purpose-bred them like cattle to become hairy test-tubes — and now they need to clean it up. The public is tired of hearing about the brutal treatment of animals at the hands of the government and of the waste associated with boondoggles like this. And even if the treatment is less brutal than it used to be, is that really an argument for not giving them a path to a potentially better life? A life that is designed for them and their needs alone? While there are many differing opinions about the propriety of using chimpanzees in research, I’m sure we can all agree that keeping the chimps in the labs will allow their continued exploitation in some manner or other. These chimps are supported by the taxpaying public and the public has had enough. Bring the chimps out into the sunlight, where we can know their names and their histories, see them thrive in living conditions that cater to their needs, and stop worrying about the things being done to them in the name of curing human diseases. The labs and individual researchers have made profits and reputations on the backs of these chimps; it’s time to repay the debt by funding their release to sanctuary. Allyson Bennett, you will need to try harder to portray biomedical research laboratories as the idyllic havens for former research subjects that you seem to think they are. Perhaps a tour of the North American sanctuaries that have rescued hundreds of lab chimps from restrictive indoor housing conditions. Most arrive pale and with sparse hair and a total lack of experience with the outdoors. This is the experience of all the sanctuaries and is no exaggeration. The last chimps remaining in the labs do seem to be housed in better conditions – group housing in corrals – but they do not reflect the experiences of the majority of chimps who have been used in research since the early 1900s. In my opinion, for the remaining chimps the difference between “retirement” in place and release to sanctuary is a philosophical one. Although conditions for many chimps still living in labs may be far better than steel and concrete indoor cages, the labs were not built with the chimps’ best interests in mind, they were built so that humans can have easy access. I have a very hard time understanding why a facility that historically considered chimps to be research subjects used for the study of human conditions would suddenly be interested in the wellbeing of those individuals. Unless, money. As for this statement – “Furthermore, those research facilities are subject to more extensive standards, greater public oversight, and more public transparency than the zoos, sanctuaries, entertainment, and private homes that house chimpanzees.” – I’m not sure whether to laugh or cry at your naivete. All of the premier North American chimp sanctuaries are USDA accredited and therefore are governed by the AWA, just like the labs. And because the sanctuaries are funded by donations from the public and private foundations, are subject to MUCH more public oversight and transparency than the labs, which are so secretive that often the only information we know about them has been found out by FOIA (or state open-records) requests and whistleblowers. If the chimps are “retired in place,” how will the public be able to learn about their conditions? I am not going to defend the private deals that NIH (by the way, these would have been public) made with different laboratories to care and manage their chimpanzees. I would even agree that there is a strong incentive for these institutions to keep the apes if that means they can continue to obtain financial support for the apes. However, if we accept this premise, how is Chimp Haven any different from these private labs you detest so much? Would Chimp Haven change its policies on housing or annual physical exams if it cost them their contract with NIH? I seriously doubt it which leads me to conclude that they are no different than any other primate facility holding chimpanzees, accept that they publically portray themselves as a “sanctuary”. Regarding other sanctuary facilities in North America, how many would take NIH money to house chimpanzees if that meant they had to follow the management and care provisions dictated by them? My guess is that most would take the money. I am not opposed to sanctuaries and I am all for improving the housing and care of captive chimpanzees. No matter how you look at it, the US tax payer is on the hook to pay for the continued care of the NIH-owned chimpanzee population.However, I am skeptical that they are willing to invest even more of their money to buildnew, and expensve retirement homes for the chimps and would prefer to have them retired in their current facilities. Let’s begin with the staged photo of Yerkes that implies lush greenery – rather than the actually near barren outside corral to which only Field Station chimps can have access. To our knowledge, the Main Station’s caging is as archaic as ever with little natural light except for doors at either end, occasionally left open for fresh air. Simply stated, chimpanzees in labs know cages…that is what they know. Even labs with Primadomes do not apparently have enough of them to allow anything other than rotational use since there are too many chimps and too few Primadomes to accommodate free and daily choice. Scarcity – Concrete – Steel. These words equate with efficiency – labs are nothing if they are not efficient. Like hospitals or nursing homes, they must deliver services as cost effectively as possible and regimentation accomplishes this. In a lab, humans dictate when a chimpanzee awakes, what he or she eats, whether they go out today or never, when the lights go on or off and whether they will be moved because of someone else’s choice and not their own. This is the reality of a life in a lab. In contrast, life in sanctuary offers chimpanzees substantial and various choices of outdoor enclosures with abundant natural vegetation. Sanctuaries do not try to pull the “greens” over our eyes, which is particularly disconcerting in an editorial that seems to be entreating for more honest dialogue. Instead, sanctuaries honestly put forth what they can provide and honestly lament what they cannot, since most agree captivity is captivity even given the lengths they go through to make it better. Further, the veterinary care taking place at the two largest chimpanzee sanctuaries, Save the Chimps and Chimp Haven, is not only equal to, but surpasses the care provided to the chimpanzees in labs. And this is for reasons beyond the actual training, experience and skills of the vets – it has to do with their hearts. They are there to serve the chimpanzees and assist in creating a life worth living. Instead, we are safe to infer that laboratory vets must be complicit in the belief that chimpanzees – and other animals – can be used, at all costs to them, for purported health benefits to humans. All of which leads to my last point. The use of chimpanzees has never been truly effective science and has been declared by the highest scientific body in the U.S., the Institute of Medicine, as unnecessary. Private labs must stop advocating the half-truths that chimpanzees have contributed greatly to human health and that those still languishing in U.S. labs will fare as well in continued laboratory confinement versus the relative freedoms sanctuary provides. Such misrepresentations are stalling the progress we have made, scientifically and ethically, to now be able to afford chimpanzees, our closest genetic relatives, the dignity of a life built around and for them, which can only be realized in sanctuary, a sacred place. Labs are anything but. Ms. Capaldo has, like many animal rights folks, a simplistic and myopic view about chimpanzee research and retirement. While she can question why pictures of the diversity of housing at research facilities, like Yerkes, were not provided she fails to consider that Chimp Haven has a diversity of housing too, some of which includes the less than ideal Primadome. Chimp Haven PR would love for everyone to think that chimps are living on plush, forest islands in Louisiana when that is factually incorrect. A majority of the chimps residing at Chimp Haven are not living in large social groups, on an island, Most are living in facilities not all that different than the caging they occupied before moving to Chimp Haven. Ms. Capaldo also mentions the dignity and sacred place that sanctuaries provide but according to what ethical standards? 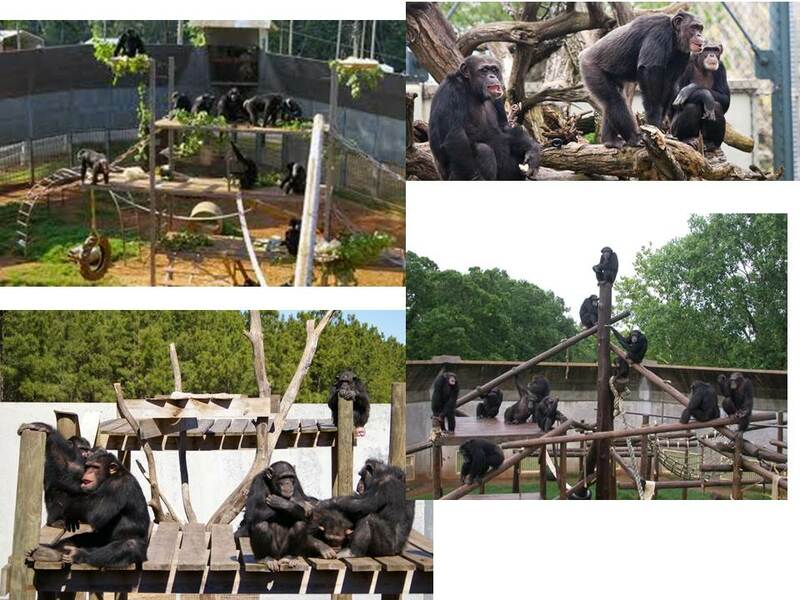 Chimp Haven is run like any other primate facility in the US. Because they receive NIH support, they must give every ape an annual physical exam, which means they are likely darted and subsequently anesthetized for their annual physical exam. Do the chimps present voluntarily for these procedures? When they are sick or ill, do they get adequate or the best possible care? Does Chimp Haven euthanize chimps or make end of life decisions for them? What are those criteria? I am sure Ms. Capaldo has some utopian view of the answers to these questions but maybe she should look behind the curtain. To suggest that research with chimpanzees has not benefitted human health or science in any meaningful way is utterly laughable. Many of the very arguments for why we should ethically treat chimpanzee different from other animals has come directly from research with captive chimpanzees. Evidence that they language capacities, self-recogntiion, empathy, theory of mind, complex emotions all came from research with chimpanzees, notably research with captive chimpanzees. Contrary to the claim by Ms. Capaldo, the IOM fully acknowledged the value of this work in their report and recommended that this research continue to be supported by NIH and other funding agencies. Research with chimpanzees has been critical for understanding human health and the origins of our species and no reasonable person can deny these facts. Well said, Gerry L !!! Curious as to why the author did not include any photos of the former Coulston Foundation in the examples. The one thing recent events surrounding Brian Williams’s misrepresentation of occupying a helicopter hit by a rocket propelled grenade should have taught us is this: credibility is everything. Misrepresenting facts to the public, whether from the news room or as fundraising tactic, may ultimately do damage in the end. These deceitful tactics adopted by Chimp Haven and others who twist truths misinforming the public for the sole purpose of financial gain may ultimately hurt fund raising efforts and in the end result in less opportunities and support for the animals that they proclaim so desperately to care about. This article itself is not credible and extremely bias the author only states what she believes are negative aspects to allowing chimpanzees to live in sanctuaries and does not once speak about how these chimpanzees that are used for research are still subjected to some pretty invasive studies and other stress from handling or being tranqued. Additionally, if you believe that these chimps being transported to a sanctuary is throwing away tax payer dollars its just a drop in the bucket compared to how much our government spends on subsidizing industries such as Ag or Oil, tens of billions.